Review of Old Dominion GiGi’s Farmhouse Ale | Beer Apprentice - Craft Beer News, Reviews, Interviews and Info. Hello everyone. Time for another craft beer review and for today’s drinking pleasure I’m going to by trying another brew from the Old Dominion Brewing Company located in Dover, Delaware. This offering is called GiGi’s Farmhouse Ale. Let’s get right to the website, olddominion.com, and see what kind of commercial description they have for us about ol’ Gigi. Shall we? 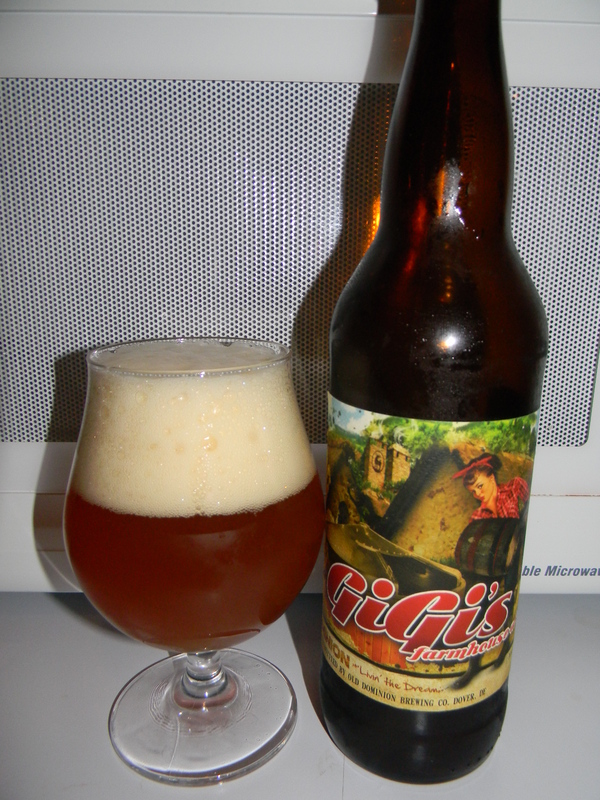 GiGi is a bottle conditioned, Belgian-influenced farmhouse ale. The flavor is sweet at first, due to the use of pilsner, oat, and torrified wheat malts, but the subtle influences of Bravo, Select, and Cascade hops add spice and a little mystery to her personality. This beer came in a 22 oz. bottle and it had an ABV of 7.2%. It poured a hazy, golden to orange color with a white head. The texture was soapy and fluffy and very rocky. It was of great size and the retention time was outstanding as well. Once it finally did decide to settle it left behind some patchy lacing that didn’t look too bad at all. The nose was fairly hoppy and floral. Some grassiness was noted and a light bit of funk and mustiness accompanied those characteristics. There wasn’t much spice to speak of. It was very minimal to say the least. It also provided some kind of mineral smell as it warmed. Hmm. Oh well. The taste let loose with some lemon citrus combined with a very light funk and grassy characteristic. Just a touch of peppery spice was found and a light breadiness was found also. Overall, the flavor seemed quite restrained and mellow. Not bad mind you. Just delicate I guess. The mouthfeel was medium bodied. Crisp, refreshing, thirst quenching and dry. The carbonation was very lively and a decent amount of flavor was left behind after the swallow for me to enjoy between sips. In conclusion, I found this to be an “ok” beer. It’s a little underscored compared to some of the other Farmhouse/Saison style beers that are being produced today, however I believe that this would be a great beer for Summer and I also believe it would be a great one to give anyone who may be interested in exploring the style for the first time. It’s a very, very, very easy drink and it has a few of the proper characteristics of a Farmhouse/Saison without completely overwhelming a palate that may not be that experienced with the genre. So, the next time you see the Old Dominion GiGi’s Farmhouse Ale… pick it up and give it a try. You may really enjoy it.